Green Star ExteriorsUPDATESConstructionIs Your Roof Retaining Too Much Moisture? As a homeowner, the overall construction of your roof is extremely important. It’s fairly easy to spot the signs of a roof (new or old) that is retaining more moisture than it should. 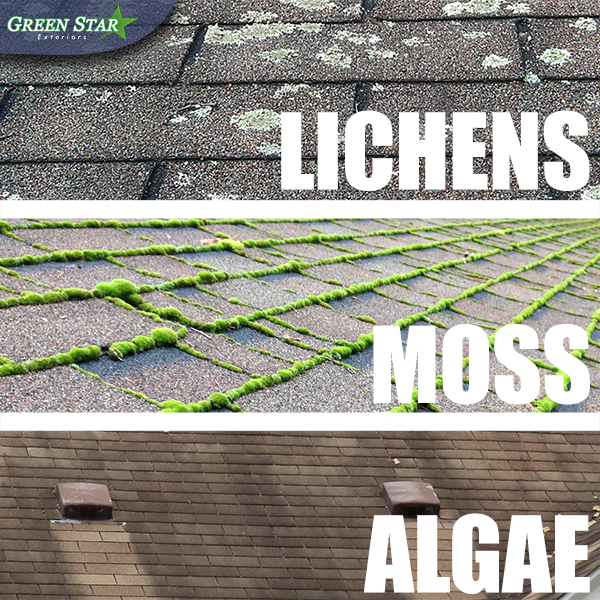 Moss growing on any roof surface will be more severe on roof sections that area shaded and exposed to periodically damp cool weather conditions. 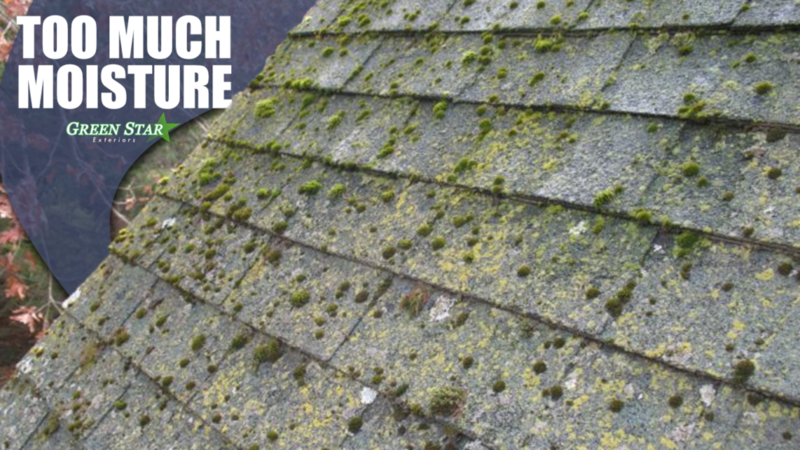 The presence or absence of sunlight on a roof surface is often a determining factor in the amount of moss or lichens growth. When shade and cool moist conditions combine, moss or lichens growth on a roof surface is more likely. Moss will speed the wear of the asphalt shingle surface in freezing climates by increasing frost damage to the mineral granule coating on the shingles. Some black stains on asphalt roof shingles are caused by a black algae. Black algae stains maybe mistaken for “extractive bleeding” – a product cosmetic defect. Roof ridge vents help to effectively prolong and protect a homeowner’s roof from common culprits within the home, including moisture and heat. 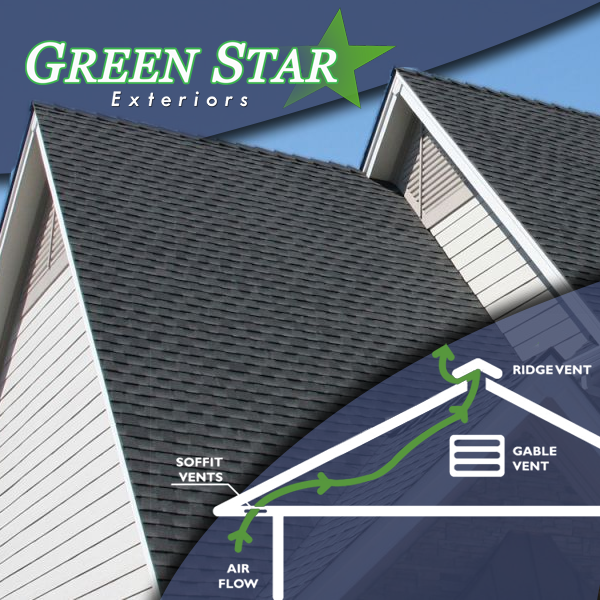 Found on most new homes, roof ridge vents offer a very simple and effective technology that many homeowners are relatively uninformed about. Here in the Tri-State area we experience all of the seasons in full force. With Fall and Spring, poorly constructed roofs and roofing materials will see the effects of moisture retention. Moisture can be released from many activities that are performed within homes, including running a washer, using a dishwasher or taking a shower. Moisture is one of the leading causes of damage to rafters, shingles, walls and insulation within homes. Roof ridge vents help to release moisture from homes. With the help of wind, a ventilation system is created in the attic with a roof ridge vent. As wind passes over the roof ridge vent, it draws air out of the attic. Fresh air is then drawn into the underside of the roof, creating a circulation system of fresh air. Another preventative measure is using algae resistant shingles when re-roofing. These are embedded with copper granules, but look no different than regular asphalt shingles.